Flat 8000 off.Flat 8000 off. Oppo F9 Pro is an elegant smartphone which delivers decent performance. Thanks to the latest processor, the device runs very fast. There are no noticeable lags while normally using the device. The drop notch design is very fantastic and looks different from the other phones in the market. Most notably is the amazing camera and gorgeous display, can’t complain anything about the camera it is superb. Premium quality phone and wonderful features. Oppo F9 Pro comes with a notch on the front which looks impressive and attractive. The device has a great build quality giving you amazing in-hand feel. The battery life, on the other hand, is way too poor. I had to charge this device a couple of times in a day. Coming to cameras, they perform well in daylight but the same can not be said for lowlight conditions. Best phone ever, the phone is really good especially the VOOC charger technology it charges the phone so fast and the phone doesn’t heat much also. The phone has a pretty good design and with really fast charging battery life is also good. The water drop design is mesmerizing and the camera quality is not below the expectations overall a good smartphone. It is the best phone I have used till now, the display is very crisp and the color temperature is very good, battery backup is up to the mark with awesome charging technology. Heating is also no problem even with the VOOC fast charging technology. Beautiful water drop notch display design is eye catchy and makes you go head over heels to buy this phone. A large display with excellent contrast and beautiful notch. Excellent battery life, VOOC charging. Build quality of the phone feel little cheap as the phone has a full plastic and even the back glass is fiberglass though the look of the really amazing. The camera lacks a lot of features in this phone like 4k recording, EIS or OIS support. The processor in the phone is also an entry-level processor which is pretty old. Looking for amazing battery life, display and software, then Oppo F9 Pro might be what you need. In terms of design, I feel like the device could have make it look more premium. The display on the front is absolutely of high quality with good color accuracy. The software is quite optimized meaning you will experience minimum lags and impressive battery life. In terms of battery life, the brand was not able to hit the sweet spot. Looking at the specifications and performance, the device feels slightly overpriced. 30 Pricebaba users have written their experience with Oppo F9 Pro. If you own Oppo F9 Pro, please do leave your feedback too. 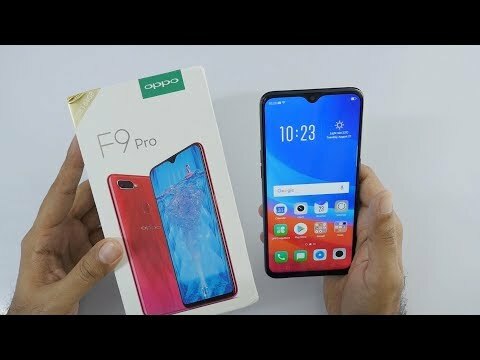 Lowest price of Oppo F9 Pro price in India starts at Rs. 17,990 Oppo F9 Pro is available on Flipkart at Rs. 17,990. Prices updated on 22nd April 2019. The design sports a trendy and gradient color scheme with a unique diamond pattern on the lower end. A 6.3-inch screen with a resolution of 1080x2340 pixels has been provided. This translates to an amazing pixel density of 409ppi. A dual 16MP + 2MP camera powers the rear with features such as face detection and depth sensors. The selfie camera is quite powerful at 25MP. In terms of specs, Oppo F9 Pro comes with the MediaTek Helio P60 chipset that supports AI processing. Additionally, it has an internal storage of 64 GB and 6GB/4GB RAM powers the phone. Oppo’s VOOC charging technology allows the 3500 mAh battery to be fully charged within 30 minutes. Connectivity options include Wi-fi, Bluetooth 4.2, GPS, micro USB 2.0, and 4G. Oppo has offered Android 8.1 Oreo with the phone that runs under a custom ColorOS version 5.2. This gives users a lot of additional features to play with.